The MicroPress is supplied with several filter cloth styles, hand-selected for your application and pilot testing needs. The unique design allows for chamber thicknesses ranging from 15 mm up to 60 mm. In talking to our customers, one of the frustrations we have heard is that it is often cost-prohibitive to ship a 470 mm test press to their site, even though pilot testing is truly a must for the kind of improvements they are looking at. We heard you. Micronics just introduced an innovative new 150 mm bench-scale filter press weighing roughly 100 pounds. At ~100 pounds, it’s more cost-effective and faster to deploy than the 2000+ pound 470 mm test press, which must be shipped via truck. Our new filter press is called the MicroPress™, both to emphasize its small size and to let you know it is from Micronics, your trusted pressure filtration experts. 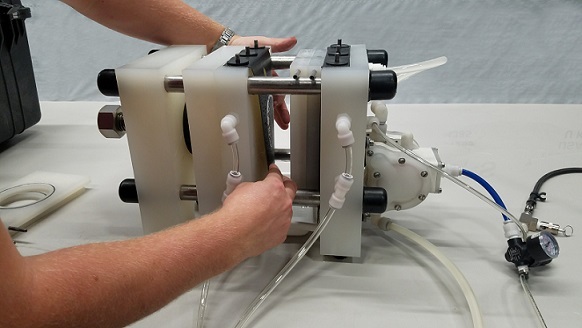 The MicroPress comes equipped with both membrane squeeze and cake blow, a combination of features not typically found in presses of this size. Renting the MicroPress from Micronics may be just the right solution to getting you on the road to full-scale production or to validating the process changes you plan to implement in your current filter press operation. Read more about the new MicroPress here. Weighing only ~100 pounds, the new MicroPress is small, easy and economical to transport, and can even be checked on an airplane and hand-delivered to a customer site for fast deployment. Contact us or call us today at 866.481.3694 to see if pilot testing is the right solution for your organization’s dewatering needs. 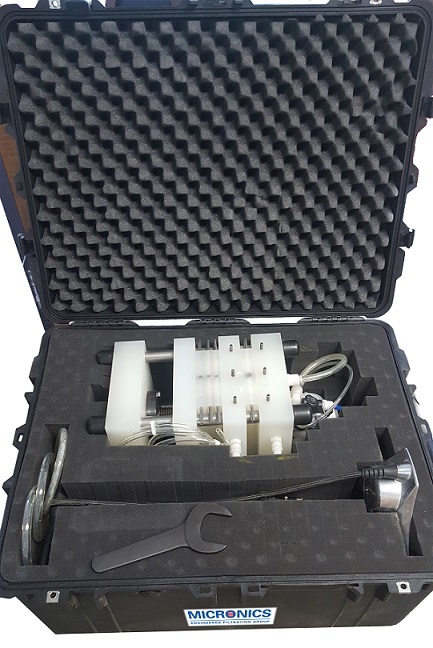 Our applications engineering team is happy to take this new “Filter Press in a Box” on an airplane and hand-deliver it to your site to assist you with pilot testing.